Ruby Duffell: Brisbane woman Ruby Duffell turned 105 on July 3. 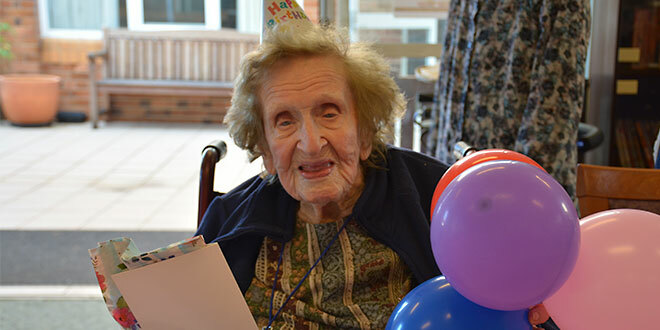 The 105 year old celebrated with residents at her home at Villa Maria, Fortitude Valley. LAUGHTER has proven to be the best and only medicine for Ruby Duffell and possibly the reason she’s made it to her 105th birthday. The mother-of-three from Brisbane turned 105 on July 3 at her home in Villa Maria, Fortitude Valley, where she’s lived for nearly a decade. Remarkably, Ruby doesn’t take any medication, not even the suggestion from doctors to take half an aspirin daily. Instead, it’s laughter that’s kept her body alive for 105 years. “I think she can always joke and laugh,” son Peter Duffell, 74, said. Born in Goodna on July 3, 1913, Ruby’s 105th birthday is just one of her many lifetime achievements. For her 90th birthday, the adventurous Catholic cruised the streets on the back of a Harley Davidson. “Mum said she nearly ripped the leather jacket on the bloke at the front, she was hanging on so tightly,” Peter said. That same decade, Ruby took an interest in a hobby most people would find too daring even while young – hot-air ballooning. She also has a cyclone named after her. 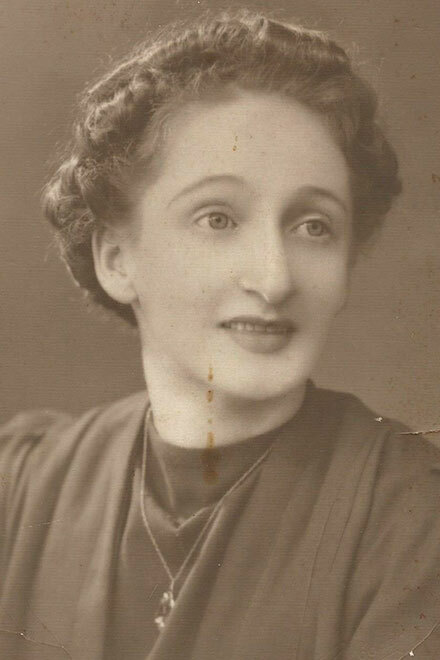 A prolific letter writer in her younger years, Ruby was notorious for voicing her opinion to principals, politicians, business leaders and councillors. Her son said because of her campaigning letters, his mum received the nickname of “Mrs Mackie”, a nod to Mount Isa unionist Pat Mackie. “I remember when Mum came home from work – she used to work for Queensland Rail – and said everyone called her Mrs Mackie,” Peter said. From her letters, Ruby managed to get an ATM display at Toowong modified, and persuaded the council to reposition a bus stop at the Royal Brisbane Hospital to better serve the elderly and disabled. Peter said along with his mum’s sense of adventure and no-nonsense approach to life, humour was her most charming quality. “She does make a big impact because she could have a laugh,” he said. 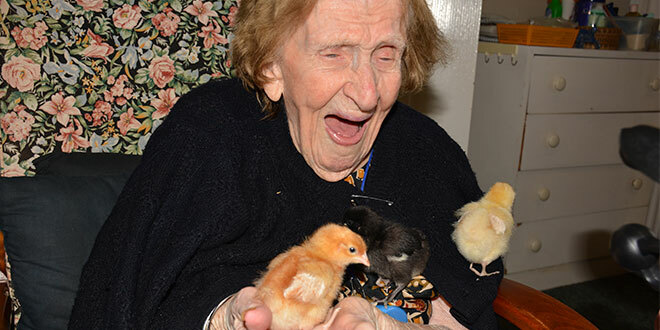 Love for life: Ruby holds a clutch of baby chicks at her room in Villa Maria, Fortitude Valley. Photo: Villa Maria. 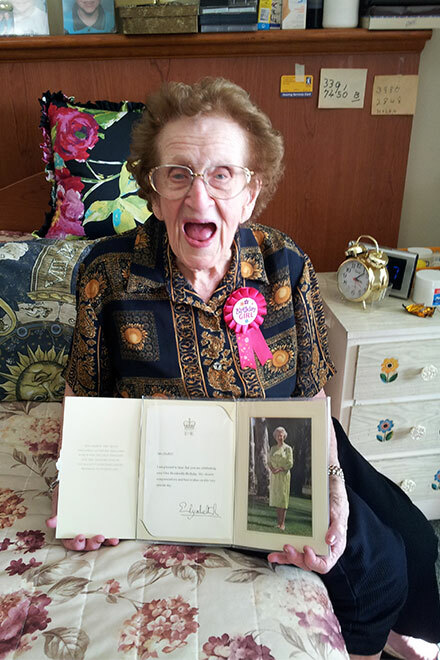 Special ocassion: Ruby Duffell with a card from Queen Elizabeth II on her 100th birthday. Photo: Supplied. But Ruby’s 105 years of life has not been easy. After marrying at Sacred Heart Church, Rosalie, in 1941, Ruby relocated to Longreach with her husband, cattle and sheep buyer Tom Duffell and two children under four. “She left family and friends in Brisbane, and was on her own in the middle of Queensland,” Peter said. “It would have been quite tough for her actually, but she managed alright. Tragedy struck the family in 1950, about 10 years into her marriage, when Ruby’s husband died of meningitis. She was left behind with three children aged eight, six and one. “She’s been a single mum for sixty-eight years,” Peter said. Ruby’s strong and independent nature proved useful in her single-mothering years, which she spent in her home city of Brisbane. She worked hard with Queensland Rail to purchase a family home on Latrobe Terrace, Paddington, and sent the children to the local Catholic schools. While she never had the chance to go to university, Ruby never lost her love for learning, spending her eighties studying Indonesian, mah-jong and the Old Testament. “She used to say, ‘I’ll be dead before I get through the Old Testament’,” Peter said. “There was nothing she wouldn’t tackle. Olden days: A portrait of a young Ruby Duffell in her late 20s. Photo: Supplied. In her younger years, Ruby also kept active by walking to Mass at St Brigid’s Church, Red Hill, which was a sloping street away from where her young family used to live. “That’s probably also what helped her get to this age, walking up the mountains to get to church,” Peter said. “She didn’t drive, she’d walk everywhere. Ruby’s love for life is also due to continue well after she eventually receives her eternal reward. The 105-year-old has donated her body for research at the University of Queensland’s medical faculty. “I doubt they have any 105-year-old bodies that aren’t on medication there,” Peter said. He said his mother’s visitors were already recognising her amazing body, with one woman “touching Mum for good luck because she’s so old”. “I think she’s ready to move on to the next phase of her life but who knows how long she’s going to last,” Peter said. Seven years ago the family thought they were about to lose Ruby when she was hospitalised for an angina attack. Peter, “thinking the worst”, packed his mother’s funeral documentation and paid her a visit at the hospital. “When we got there she was having the time of her life,” he said. After that health scare, he never expected his mum to reach 105. “Every year for the last five years she’s said to us, ‘I won’t be here when you come up next year’,” Peter said.